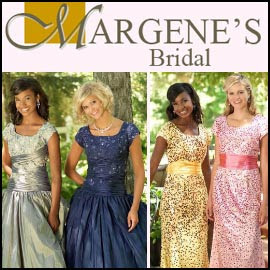 Margene's Bridal is an Idaho-based business that offers worldwide shipping on a large selection of attractive and modest special occasion dresses. The website displays many popular prom dress styles, all with short sleeves or cap sleeves. You'll find sheath dresses with prints, tulle ballgowns, elegant empire waists, and several options with rhinestones. The online gallery presents dresses in many different hues: burgundy, blue, seafoam, pink, peach, red, teal, and several colors that have a metallic appearance. The website also has a section of photos that displays happy customers wearing their prom dresses. You may also want to visit the "Bridesmaids" section of the site to find addition dresses with sleeves that would be suitable for homecoming or prom.